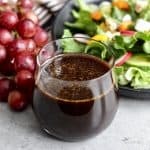 Balsamic Vinaigrette is one of the easiest salad dressings you can make! 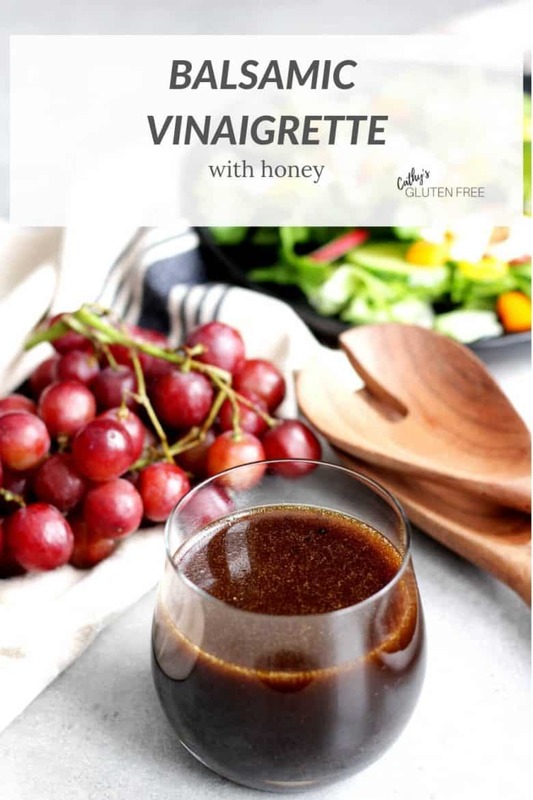 This healthy balsamic vinaigrette recipe is sweetened just a little with a touch of raw honey. Unless we’ve just met, you’ll know that I love my fresh salads! I serve one with almost every meal and often order them in restaurants. Being gluten free doesn’t mean that you must fill up on gluten free breads and baked goods. Our diets should consist mainly of vegetables, fruits, and clean proteins. What do you like to put in your lettuce salad? Now you can add Balsamic Vinaigrette to your rotation. It’s a very simple dressing that will serve you well. 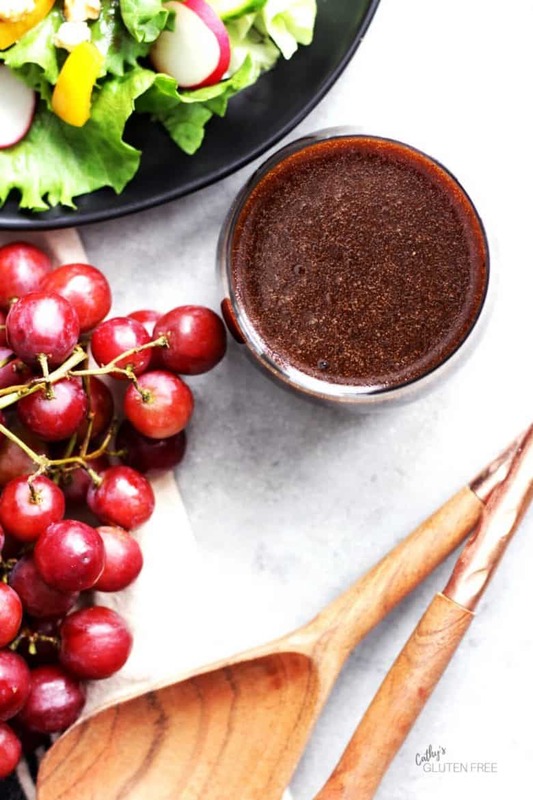 Because the success of your healthy Balsamic Vinaigrette recipe depends on the quality of the olive oil and balsamic vinegar that you use, choose them wisely. Buy the best olive oil you can afford. If possible, purchase your oil where sampling is offered. It should smell fresh – like olives – not rancid, musty, or vinegary. There’ve been reports of olive oils that are not pure olive oil, but rather diluted with less expensive oils not noted on the label. Try to find a trusted brand. Olive oil doesn’t have as long a shelf life as one might think, so buy it in small enough amounts to use up quickly. It should come in a dark glass bottle or tin as light will destroy its flavour. A high quality balsamic vinegar makes this dressing amazing! Conveniently, balsamic vinegar is usually sold in the same stores that sell olive oils and allow sampling. 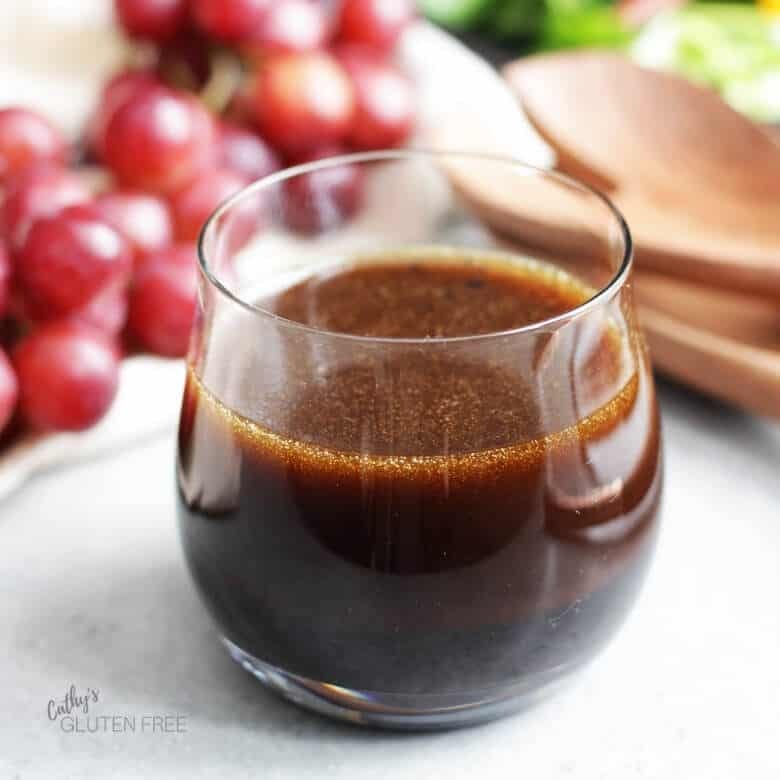 For this recipe, I use a basic balsamic vinegar, but it would be fun to experiment with some of the varieties of vinegars offered! 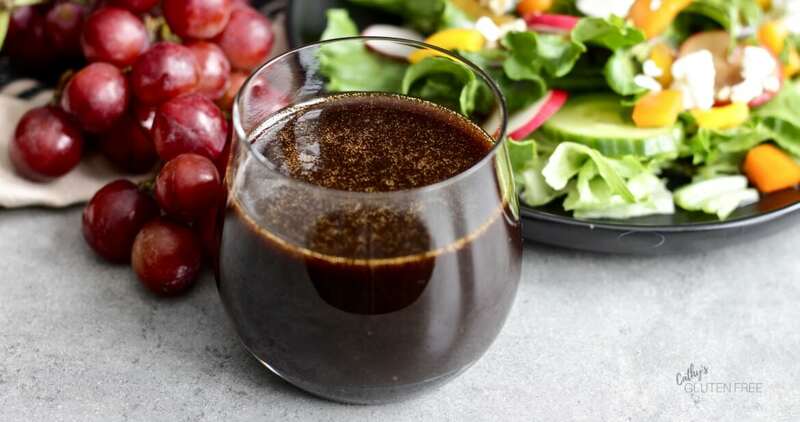 Balsamic vinegar is made from grape juice that has been cooked until it’s reduced into a syrup called must, which is then fermented and aged in wooden barrels. For more information on balsamic vinegar, check out this article on The Spruce Eats. Read your labels carefully. The best balsamic vinegar is labeled 100% barrel-aged balsamic vinegar. Many less-expensive ones will contain wine vinegar or red wine vinegar and caramel. If you can’t get pure balsamic vinegar, at least select one that has balsamic vinegar listed first, before wine vinegar, on the ingredients list and doesn’t have other added ingredients. Simply combine the five ingredients in a jar, screw a lid on, and shake it up! It’s that easy to make delicious salad dressing! Are you counting calories? If so, you’ll want to know that this salad dressing contains 71 per tablespoon. Tossed with a big bowl of lettuce and raw vegetables, it will give you the feeling that you have eaten enough without bogging you down. I have counted calories in the past. Sometimes it’s a good way to get a handle on how much we’re consuming. However, I feel that it’s more important to concentrate on the quality of nutrition we consume, fuelling our bodies with the foods that are good for us, and moderating our portion sizes. It’s my hope that a delicious salad dressing like this one will get everyone eating more vegetables! 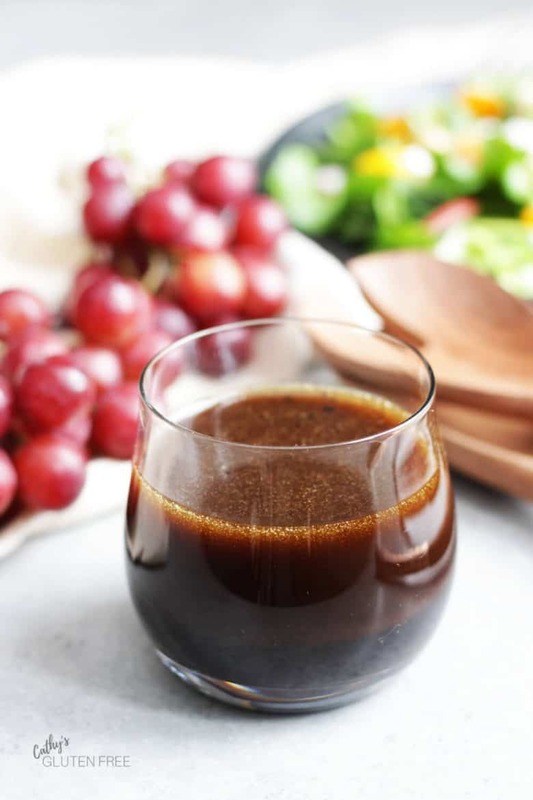 This simple healthy Balsamic Vinaigrette recipe relies on good quality olive oil and balsamic vinegar, so choose the best you can afford. Combine all ingredients in a jar, put a lid on it, and shake to combine. 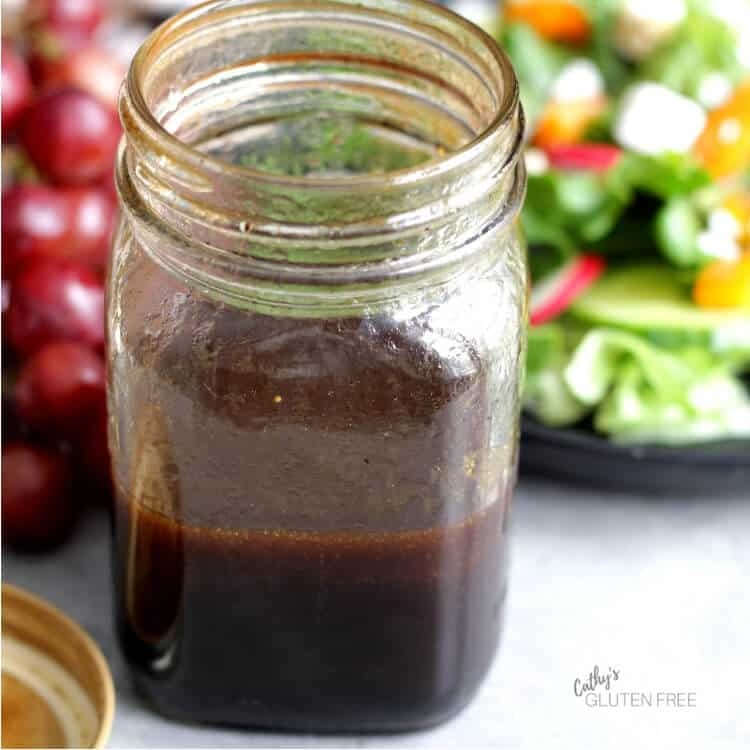 Balsamic Vinaigrette is one of my all time favorite dressings! I’m a happy camper with a big salad and this dressing! Isn’t it wonderful when made with a great balsamic vinegar!